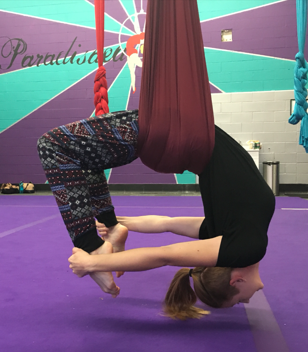 Aerial Yoga is a modern style of yoga that incorporates a low-hanging soft fabric hammock to explore alignment, release chronic tension, hang around upside down, and have fun! It’s appropriate for anyone including beginners with no yoga experience. For experienced yogis, aerial yoga will add a new dimension to complement your existing practice on the ground. For those with little or no yoga experience, aerial yoga is a great place to start. Classes include decompression, supported inversions, core and upper body strengthening, deep relaxation, and fun! This class is appropriate for anyone whether or not you have previous yoga experience. Beginners to aerial or yoga Experienced yogis who want to learn a different way of practicing yoga. Experienced aerialists who want to learn a different way of practicing aerial. Anyone wanting to improve their body awareness and mental strength and focus. Any adult of any age. Certain medical conditions can make this class inappropriate. These include but are not limited to uncontrolled high or low blood pressure, glaucoma. Please check with your doctor if you are uncertain, and contact us with any questions.